Since I'm teaching so much these days, I thought it would be fun to write about my students and what they're making. And damn, I have some talented, interesting students. Let's start with two ladies you've probably seen around the blogosphere. Oona and Debi came in to take a private lesson with me last week. Readers, I can't believe I get paid for this. Hang out with two amazing, funny, charming, sewing enthusiasts for two hours? Yep, I'll take that job! 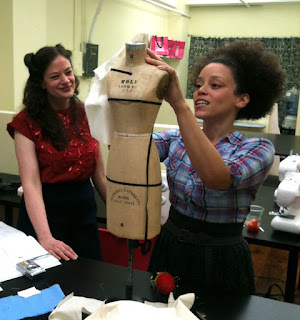 These gals wanted to learn bound buttonholes and a bit about draping. We started with an hour on buttonholes and they picked it up super quickly. I'm a recent convert to the patch method (more on that later) so that's the technique I taught them. On to hour two. Oona was curious to learn more about draping--which, mind you, I've never actually taught. But I won't let a silly detail like that stop me! I was lucky enough to score a vintage half-size dress form last week (from Sew Fast Sew Easy, which is sadly closing up shop). It's a Wolf, and I've named her Tiny. She's the perfect size for demonstrating and experimenting upon. Oona skipped the basics and made some crazy pleated-shoulder design. It was awesome. After our lesson, we went out for a lovely Italian dinner. The whole night was just so much fun--exactly what I needed. My cheek muscles got a workout since I pretty much laughed the entire time. Thanks, Oona and Debi! More to come on my other students and what they're making . . .
Two of my favourite women! Oh, I what I would have done to have been there. One day, one day... Bound button holes - another technique for me to learn. I am so envious! I wish there were sewing lessons locally, let alone ones that cover bound buttonholes and draping! Even your students are gorgeous and fabulous. That does look like a LOT of fun! When will you be running these classes in Sydney? Too far, I know, just kidding... but Debi travelled a long way for the class, didn't she lol! I had SO MUCH FUN! Thanks so much for the lovely day and I'm so happy I learned how to do bound buttonholes and draping!! So jealous right now. Moving to NYC asap! Looks like great fun... I just wish I was closer to profit from such a great and fun looking lesson! awwwww they are so cute- can't wait to see what they were working on. I have seen Oona's blog, but not Debi's. Now I will add Debi's to the list of bloggers I will follow! What fun! 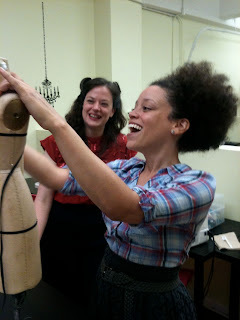 That little dress form is adorable :) And I follow Debi's blog and love it! I'll have to go check out Oona's. I thought I felt a disturbance in the Force. Having that much creative genius in the same room at the same time must have been intense! Lucky you (all of you). It sounds like so much fun! So fun, sounds like a great evening! @ katrina: that is too funny. gretchen, i am FROTHING AT THE MOUTH for a dress form now. you and your fabulous skillz have ruined me! I am so bloody jealous that I have to admit it! This looks like so much fun! Oona looks a lot like the lovely and talented Marcy Harriell, are they one and the same? So jealous, but it looks like a fabulous time was had by all!! Where did you locate that miniature size dress form. I would love something like that for my studio. Please advise.